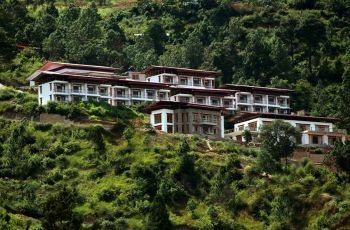 Damchen Resort is located just beside the Puna Chu is one of the best resort in Punakha, central Bhutan. It has one of the best view and location and provides a calm and peaceful stay. Surrounded by lush green gardens, flowers and trees it gives you the feeling of being one with Nature. The surrounding hills adds to the scenic beauty of the himalayas and makes the overall experience a beautiful one. 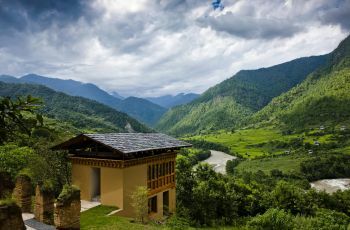 Damchen resort has been designed to provide the guest with comfort and peaceful stay as each of the room has been carefully designed to capture the beauty of Punakha valley and Puna Chu river. All the rooms are spacious and carefully furnished with quality furniture, linen and tapestries.The rooms are divided into Oval Room (Deluxe), Puna CHu (Semi-Deluxe) and Standard. 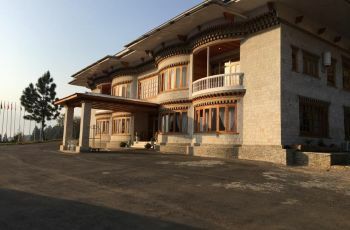 Oval rooms are designed with an oval window to add to the beauty of the room with large glass windows through which the hills surrounding the Punakha valley and the majestic Puna Chu river flowing just few hundred feet away can be viewed. Interiors of the rooms are well furnished and best quality tapestries and linens are used. Soft and cozy queen size bed with side table makes this room a perfect stay for a sound and peaceful night. Puna Chu rooms are designed to meet the demand for bigger groups where the number of beds are more than the oval rooms. It also has all the amenities of that of oval rooms and are equally spacious. Standard rooms are designed in twin bed and single queen size bed to cater to single or couple travellers. It is spacious and finest linen and tapestries has been used in these rooms. Satisfaction of our guest and a comfortable stay at Damchen Resort is what we strive to provide to our guest and to achieve that we have all the amenities of star hotels in our resorts. 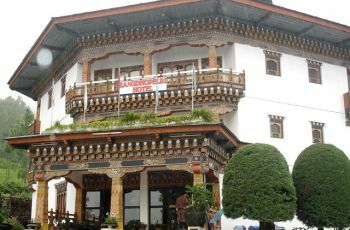 We also provide biking tours facility to our guest along with numerous other outdoor activities and this list will keep increasing as we strive towards making Damchen Resort on of the best in Bhutan which in its ability is already regarded the best by the travellers. Do you own/manage Damchen Resort ?